Are there any differences between the autistic person's brain and the non-autistic one? To be more specific, are there any differences in brain structure or brain activity, that can be used to distinguish between autistic and non-autistic person by analysing their brain structure and brain activity while performing various tasks? If so, can functional imaging itself be used for diagnosing autism? Is there any research with that theme? While quantitative changes like the ones described in the EEG in the other answer are critical in distinguishing an person with autism from a non-autistic person, they are not really diagnostic tools yet. You had mentioned the possibility of using a CT scan for a diagnosis. As far as I can tell, there is no way of doing this as of late, but several groups are taking a look at some of the anatomical differences, which, of my own supposition, in the future could lead to definitive imaging techniques that are diagnostic. Along with the EEG studies, there are currently functional MRI studies that attempt to quantify the differences between persons with autism and others, but these are likely not diagnostic as well. Oblak et al (2011) found that, despite evidence of "overgrowth" of neurons in areas such as the Prefrontal Cortex (see here for an recent study also drawing that conclusion), neurons in the posterior Cingulate Cortex were normal in number and density, but "irregularly distributed...poorly demarcated layers IV and V, and increased presence of white matter neurons." The diagrams below illustrate the position of the Cingulate (looking from the perspective of the inside of the hemisphere) and the normal arrangements of typical cells in cortical layers (which may have some minor variation depending on where in the cortex you are looking). To illustrate the nuances in the anatomy, it had been found in prior studies that even the anterior Cingulate, by and large, had the increases in density found elsewhere in the cortex. 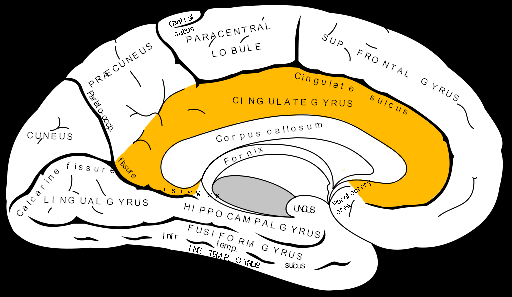 What's interesting about the much lower cell density in the posterior Cingulate is that that structure is thought to be one of the most important regions of the limbic system for determining emotional salience of a situation, something that has been found to be different between persons with autism and those without autism. So now we know that this region, just like the anterior portion, has an irregular anatomy, just of a different sort. The study also found that, by and large, the architecture of the neurons in the fusiform gyrus was undisturbed. Given the role of areas in the fusiform gyrus in facial recognition and social interaction, this was surprising, but there may be other clues in these areas as to difference in receptor density (particularly of GABA, though no difference was found in this particular study). So, in terms of markers for future imaging studies, there are distinct differences that can be picked up in studies of brain tissue, but nothing definitive to be picked up at the scale of CT or MRI in an in vivo imaging study. Researchers at Boston Children's Hospital compared raw EEG data from 430 children with autism to data collected from 554 control subjects, all ages 2 to 12. They found that children with autism displayed consistent EEG patterns which indicate altered connectivity between brain regions. They found evidence of altered connectivity throughout the brains of children with autism. Most remarkably, they found a pronounced reduction in connectivity in regions of the left hemisphere controlling for language areas of the brain. Young children with autism showed increased connectivity between brain regions that were farther apart, suggesting they may have developed a compensation mechanism for other connectivity problems. Not the answer you're looking for? Browse other questions tagged neuroscience autism or ask your own question.